The shock wave that followed the news of Davy Jones’ passing last week shook loose this realization: There have always been four Monkees. You thought there always would be four. Now there are three. There will never again be four. It was the same shock wave that followed the news of John Lennon’s death in 1980. There had always been four Beatles. You thought there always would be four. Then there were three. And then, 21 years later, there were just two. Davy Jones was the man the Monkees could not lose, just as John Lennon was the man the Beatles could not lose. Davy Jones and John Lennon in the same breath? Absolutely. Going on without them? Unfathomable. Time proved Davy Jones irreplaceable. Girls who loved the young Davy Jones kept that torch burning for years. Fans — including some remarkable names — kept finding the Monkees’ music fresh and vital decades later. Only the most fearless, confident entertainers can pull off a self-deprecating line like that with such ease and charm, immediately winning over an audience not sure what to expect from a man who long ago was a teen heartthrob. 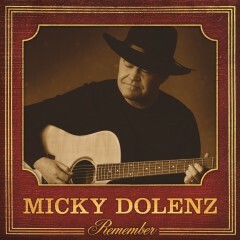 Micky Dolenz is a better singer. Peter Tork and Michael Nesmith are better musicians. But Davy Jones was a great entertainer, the straw that stirred the drink, and that’s why it’s impossible to imagine the Monkees without him. Davy Jones and John Lennon were friends. Lennon enjoyed “The Monkees” TV show and thought the lads to be a bit like the Marx Brothers. High praise. “He was a very big influence on my life, John Lennon, you know? So when you think of the Monkees and the Beatles, remember their mutual admiration. “There’s talent there,” George Harrison was to have said. Ah, what a time it was. Imagine. “Paperback Believer,” Mark Vidler (Go Home Productions), 2004, from “This Was Pop (2002-2007),” a free collection of the British producer’s mashups. To mark the fifth anniversary of AM, Then FM, we’ve gone back to the photo that graced the top of the blog as it landed on browsers in the last week of February 2007. The boy in that picture is our son, Evan. Evan was 9 when that picture was taken in Duluth, Minnesota, in September 2004. He’s 17 now, yet he vividly remembers our long-ago trips to Duluth. What are your vivid memories from when you were 9? Mine came rushing back earlier today with the news that Davy Jones of the Monkees had died. When I was 9 in September 1966, “The Monkees” were must-see TV on early Monday nights on NBC. Mostly, it was for the skits and jokes and gags that would be the catch phrases at school for the week to come. Eventually, though, the songs became the tidal wave that carried everyone along. So many friends — and friends’ sisters, mostly — had Monkees 45s. You heard them everywhere. Today, I’m amazed that I came to know so many Monkees songs without having camped out in front of the radio for hours. 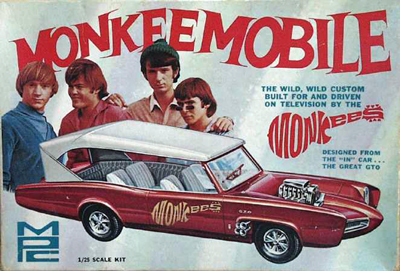 Beyond the songs, I most vividly remember my Monkeemobile model. This one. Somehow I managed to put it together. Eventually, though, it got played with, as all models do. One day, the flimsy supports on that low-slung roof folded up like an accordion. Just like that, my Monkeemobile was a convertible, just another tricked-out GTO headed for Model Demolition Derby. I also vividly remember drawing the Monkees’ guitar logo. This logo. We called it freehand drawing — sketching a copy from sight, and never tracing — and I did a lot of it. Sports logos, mostly, but I did this one, too. A couple of years later, I did the Woodstock logo, which was just a different kind of guitar. The Monkees’ music belongs to everyone. That was apparent from the tremendous outpouring of memories on Facebook, on Twitter, on the blogs and in seemingly every corner of the Web today. 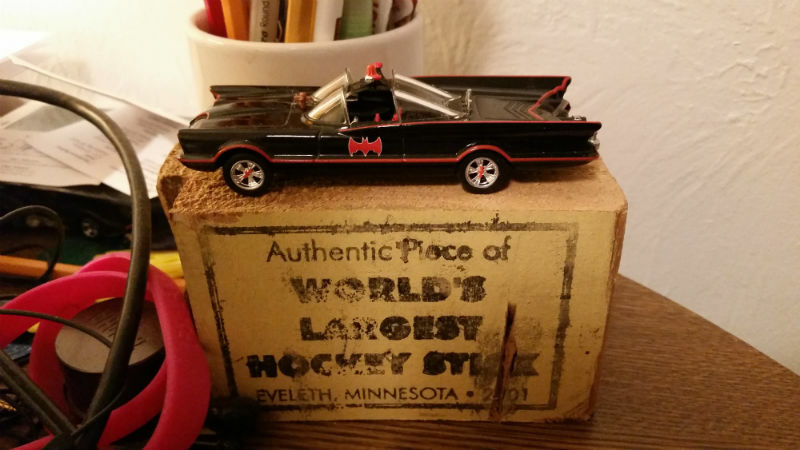 The Monkeemobile with the collapsed roof, the freehand drawings, those memories belong to me. As do the memories of being just a couple of rows from the stage when Davy Jones brought his solo act to Green Bay back in the fall of 2010. We sat there, marveling at his charm and energy, and digging all those great Monkees songs. He certainly seemed that way. The years just washed away, for him and for us. “Valleri,” the Monkees, from the Colgems 7-inch, 1968. This is the single edit, which fades at the end. 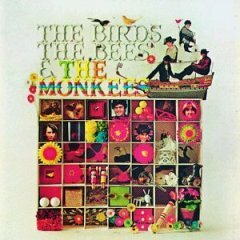 An alternate version, with a more distinct finish, was released on “The Birds, the Bees and the Monkees” in 1968. It’s out of print. Davy Jones sang these, too. Neil Diamond wrote them. “A Little Bit Me, A Little Bit You,” from the Colgems 7-inch, 1967. This was the first time Davy Jones had sung lead on one of the Monkees’ singles. “Look Out (Here Comes Tomorrow),” from “More of The Monkees,” 1967. All three cuts are available digitally on “The Best of The Monkees,” a 2003 release. It comes with the territory — I’ve lived in Wisconsin since 1965 — but I really am tired of being cold this winter. Maybe that just comes with being older than dirt. I could use some nice sunny pop goodness. Maybe you could, too. You’ve heard ’em all, but dig ’em anyway. “Green Peppers” and “A Taste of Honey,” Herb Alpert and the Tijuana Brass, from “Whipped Cream and Other Delights,” 1965. 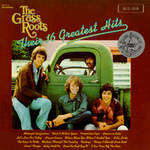 “I’d Wait a Million Years,” 1969, and “Temptation Eyes,” 1970, both by the Grass Roots, from “Their 16 Greatest Hits,” 1971. It’s out of print, but both cuts are available on this best-of CD. “Valleri,” the Monkees, from “The Birds, the Bees and the Monkees,” 1968. 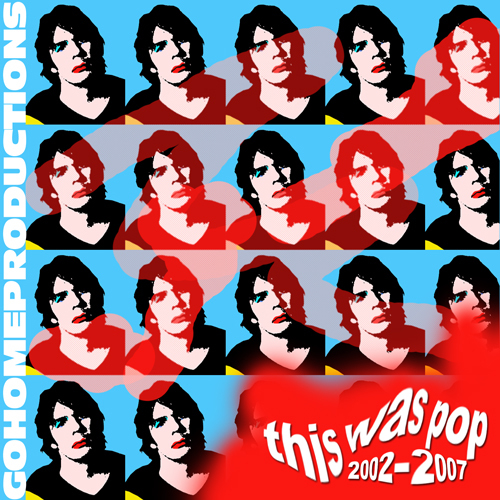 “Paperback Believer,” Mark Vidler/Go Home Productions, 2004, from “This Was Pop, 2002-2007.” This Beatles/Monkees mashup is among the many swell Vidler creations available at his web site. Go get ’em. Oh, yeah, I feel much better now.